shall wail because of Him. To be sure, Christ will literally return for His people. And the Bible makes it clear that, “every eye shall see Him”. But prior to Christ’s literal return, He will come spiritually… into the heart of every True-Worshipper. Just listen to this amazing revelation from the Epistle of Peter… “We have also a more sure word of prophecy (The Bible); whereunto ye do wel l that ye take heed, as unto a light that shineth in a dark place, UNTIL THE DAY DAWN, AND THE DAY STAR ARISE IN YOUR HEARTS” 2nd Peter 1:19. Peter here tells us to cling to the Bible as that sure Word of prophecy. But he also says we cling to that Bible till the, “dawning of the Day”. So we now begin to see that there is more to Christ’s Second Coming that we originally thought. What in the world could this above verse be speaking of? And how does this verse apply to me as an individual Christian? Jacob represents all Christians who must wrestle through this coming “Time of Jacob’s Trouble”. Now the story of Jacob and his brother, Esau, is likewise the story of the Christian life. But like Jacob’s night of wrestling, this account is also veiled in allegorical symbolism. Esau represents “The Old Man” of flesh, spoken of by Paul, in such places as Ephesians 4:22. Jacob represents the man of the Spirit. And just as Jacob and Esau were born as twins, so too, the Christian has a dual personality, so to speak. And there still exists in every Christian a struggle between the spirit and the flesh. The Christian constantly battles against the flesh. So it now is evident that there exists a struggle in the life of each and every genuine Christian. The coming conflict will be a time in which each Christian will wrestle for the victory over self. And though like Jacob, the Christian will think he or she is wrestling with the enemy. But when the, “dawning of the day” arrives, it will be discovered that their struggle was really with the Lord. And at that time, the Christian will, like Jacob, lose his or her old name, “Jacob, the Deceiver”. And they will be forever pronounced with their new name, Israel. Just like Jacob, they will have prevailed with God. And like Jacob, they will be able to say, “for I have seen God face to face, and my life is preserved.” Gen. 32:30. The story of the Levite and his Concubine is a concept which God has written in the Stars. You see, the Revelation 12 Dragon is a picture of Satan and his armies. But if you look closely at the tip of his tail, you will notice that it is made of a cluster of Stars known as The Pleiades. This cluster is in the shape of the tip of a lion’s tail. But if you look closer (looking with telescope or looking just at photos) you see that The Pleiades looks like a woman (photo to right). On one hand it appears as a harlot, riding a beast with a wine-cup in her hand. But then, if you step back you will see this same constellation. God has a people in Babylon. Yes, Mystery Babylon is the Mother of Harlots. The sketch to the below left, shows her riding this beast with 7 heads and 10 horns. 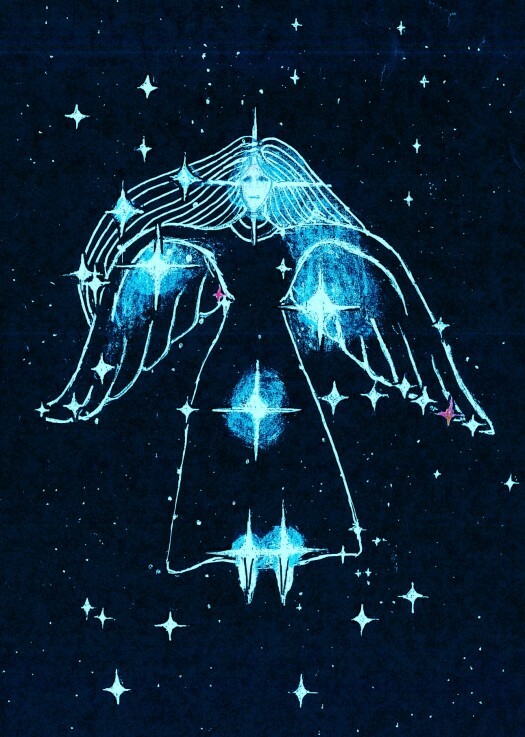 And so in addition to The Pleiades appearing as the Mother of Harlots, we also see this second depiction of The Pleiades as an angel, which symbolizes God’s people (see picture below, right). They must be called out of spiritual harlot city, Babylon (picture to left). And so the story of this concubine from Judges 19, who played the whore, but at the end she came back, only to die, clinging to the threshold of the door; this is the same portrait which The Pleiades presents. That is, this Pleiades Constellation presents a picture of the Church, portrayed as a harlot, but also as an angel taken captive. But the story of this concubine has a climactic moment of truth, as this concubine returns to the door, following the night of her being abused. And this dramatic moment happens at the dawning of the Day. Listen… “Then came the woman in the dawning of the day, and fell down at the door of the man’s house where her lord was, till it was light. And her lord rose up in the morning, and opened the doors of the house, and went out to go his way: and, behold, the woman his concubine was fallen down at the door of the house, AND HER HANDS WERE UPON THE THRESHOLD.” Judges 19:26, 27.